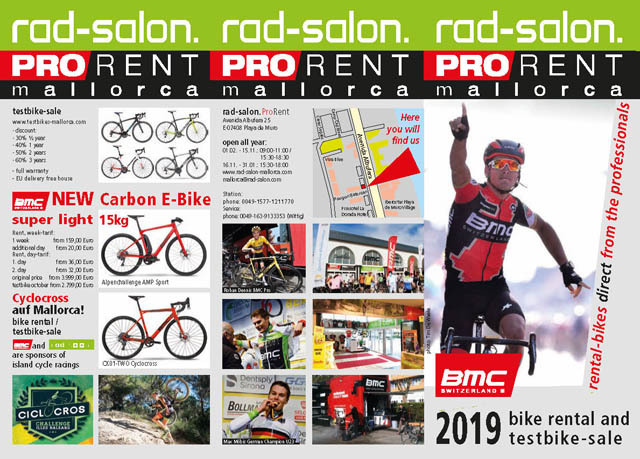 Rad-Salon, a traditional german bike-shop: Since february 2013 exclusively as "Rad-Salon BMC Pro Store Mallorca" on the prominentest bike-island! 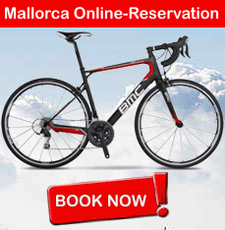 Here you can test and rent the newest bikes from BMC. You also can have high quality parts by famous Brands like Continental, Garmin, Sigma, Topeak, SKS, GoPro and more. Also Bike-Clothing by SKINFIT, Castelli, Maloja, Oakley, Evoc and more ist available to test and purchase. Our partner „Sunvelo“ offers VO2max-Tests in our shop. We also can book your entire stay including bike rental and all the trimmings. Our partner-hotel is Sunwing-Resort Port d’Alcudia with our own bike-station in the basement. With the main shop, we are located in the north of Mallorca, Playa de Muro. Our shop is located in the epicenter of cycling and all sportive cyclists meet themselves in front of our shop. Our shop was born from the passion for cycling we would like to convey to you. We present on almost 400sqm absolute NEW exclusively by BMC, Garmin, Castelli, Continental, Sigma and so on. You have the option of all models to examine thoroughly and test. A lot of BMC models are available for rental. In our lounge we invite you to linger and talk about your trips and training lessons or even technical details regarding Bikes and more. Of course, all cycling events are shown during your vacation with us: Giro d'Italia, Tour de France, etc. Spam-Protection: Type the Word "YES"